Bhagawan is Supreme Divinity. He alone willed His descent on earth, and as the eternal source and spring of enlightenment He did not in this physical life have to achieve the non-dual state of consciousness. His withdrawal from the body was equally the Will of Supreme Divinity. The incarnation of an Avatar was a blessing for all those who yearned for the presence of the Lord, and indeed for all creation. Baba’s physical life on earth was perfect in every way. He provided the example of how we all should live and He emphasized the potential in each of us to realize our innate divinity. As perfect as Bhagawan’s incarnation and physical life was, His withdrawal from His physical body could only have been perfect, whether we have the wisdom to know it or not. Bhagawan came to teach us how to lift ourselves from the depths of selfish living to the lofty heights of selflessness by threading the paths of Karma Yoga, Jnana Yoga and Bhakti Yoga. He taught us that God is Love and that we should Live in Love. He addressed us Prema Swarupa (Embodiments of Divine Love) and emphasized our true nature as Divyaatma Swarupa (Embodiments of the Divine Atma). What we may have thought was unimaginable in our lives, He revealed to be our sole purpose and ultimate reality. Can there be anything sweeter in life? We got to taste the nectar of His Divine Presence here on earth. What good fortune!! Reading and knowing about God is one thing but experiencing Him is quite another. What a great boon it is to come face to face with the Poorna Avatar, the Yuga Avatar, the Almighty Lord of this universe. Mahasamadhi Day is a day for humility and gratitude. We thank Bhagawan for being the Effulgent Sun that removed darkness and conferred light and warmth in our hearts. We thank Him for the gift of Jyoti Meditation and for His discourses, the eternal stream of divine wisdom, that will always lead the sincere aspirant from untruth to truth, from darkness to light, and from death to immortality. We thank Him for revealing His presence ever so frequently even now, so that we never forget that Sai Is. Without His Blissful Physical Form we take refuge in His Immortal Form, His words. He was the epitomy of Dharma and as such we strive with self-confidence in the knowledge that by following Him we live dharmically. He left His footprints so that we may follow Him, face the devil within, fight to the end, and ultimately finish the game at His Lotus Feet. There is nothing sweeter in life! How can the Omnipresent go anywhere? He is the very essence of our being, without Him there is no breath. We must strive to know Him, feel Him within and manifest Him through the purity of our hearts and our thoughts, words and deeds. 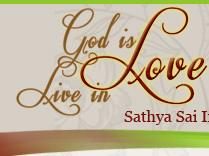 Time has come when we must intensify our sadhana to feel His Divine Presence everywhere.